Certain places can having lasting sentiment, even though the location can obscure significant aspects from a visitor, has ever-moving edges, has no clear focus at the centre, nor a fixed meaning for people. Curiosity has led me to go beyond my subjective, inward-looking opinions and to seek a humanistic geographer's appreciation of what place means. A supermarket car park can have three hundred spaces, but the one with the word POLICE stencilled across it has become a place. A place is a location where particular meanings have been ascribed. Place is complex and it is only in recent decades that scholars have sought to understand why the concept of place is of enduring importance for us to sort and grasp in our own minds. Atmospheres, history, memories and sensory perceptions all play a part in holding a sense of place. The artist is well placed to bring the complexities of place into form. They can emphasise singular features of a location, omit 'unnecessary' information, and show the 'clearly invisible.' My recent research has looked to disciplines beyond visual art that can assist the artist to be thorough in their assessments prior to representing place. This website will highlight geographical ideas that can become artists' themes; it highlights the work of an artist-as-geographer. Ways of visual thinking have also been considered and this website's pages are sorted into approaches where inner thoughts, such as memory or imagination, outward looking thoughts such, as analytical survey or taxonomy, as well as the favoured combination of these two pathways to understandings are showcased. 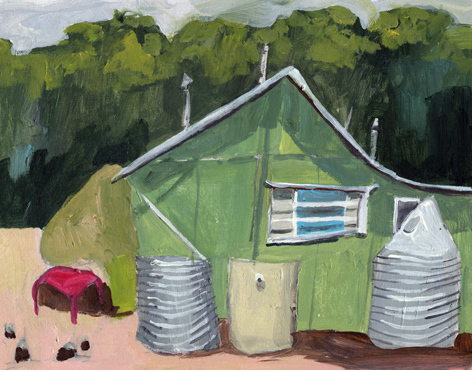 The artworks display the often overlooked aspects of domestic life in South Australia. Home was a rich source of inspiration to reflect on holistic philosophy, place-making, environmental awareness, vernacular architecture and dwellers' innate creative abilities to make life more comfortable. This could be seen as appreciative enquiry. A geographical template has been used that can be applied to studying place in any location. One could consider a settlement on Mars with the same holistic criteria that has been used here. The corner stone of my research has been geographer David Seamon's triadic approach to place based on John G. Bennett's systematics. Seamon clearly shows how the atmospheric character ( common presence or genius loci) interacts with the people as well as with the features of the geography (whether person-made or from the natural world). Man can not be separated from the atmospheres and geographic ensemble. The artist-as-geographer has the opportunity to meld their imagination and selective choices with the 'evidence' they have observed in the world around them. As philosopher Alva Noe suggests, it is the visual artists' role to organise information. As my research has continued the 'feel' of the land became most important. Aboriginal advice suggested that the birds would deliver messages. This was metaphorically so. Native parrots would lead the car along the country dirt track, much like dolphins guide a boat. Birds would fly down only to dance and sing for my behalf. These small joyous moments were stepping stones for this research, for nature's presence, its feel, its interconnections underscored all the artworks. This strong sense of interconnection, so prevailing in Australia, moves this art-as-research closer to quantum science. My "landscape enters the home" scenes may help to explain far more than regional, personal, sentiment. The artist-as-geographer has the opportunity to meld their imagination and selective understandings gleaned from analysis.